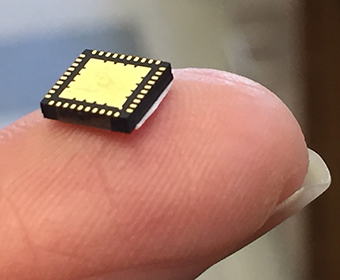 The chip makes batteries smaller and low power electronics work more efficiently. (May 1, 2017) -- Ruyan Guo, Robert E. Clarke Endowed Professor of Electrical and Computer Engineering at The University of Texas at San Antonio (UTSA), has received a $50,000 I-Corps grant from the National Science Foundation to commercialize a chip that can make lower power electronics, like cell phones, work more efficiently. "The purpose of this grant is to better identify the commercial opportunities for technology created at universities," Guo said. "This chip can be used with anything that runs on a battery," said Binzaid. "It manages power so that the device can last longer." "The heat is a result of a lot of power being used," Guo said. "It's a nuisance, but with our device there is less power consumption, which means the heat will be much less of an issue." Guo noted that as the "internet of things" becomes more integrated into the average person's daily life, battery power will continue to become a valuable resource. Beyond lower power devices such as cell phones, the chip could be used in fire sensors, fitness monitors and even medical apparatuses. "We hope to make a significant leap forward in defibrillators and pacemakers," she said. "Invasive surgeries to replace medical devices that are running out of power could become much less frequent."